On the TextBoom dashboard, to the left you will see a "Quick Broadcast" module that allows you to send out a message to your contacts easily. The campaign name is internal, so your customers will not see what you choose. Choose the contact list to which you'd like to send your message. Quick broadcast messages will default to "Launch Now" and be sent out immediately, so make sure to select "Date" if you want to schedule your message to go out at a later date or time. Compose the message you'd like to send in the box that says "Enter your message here..." This is the message your customers will receive. You have the option to test your message to up to 4 cellphones numbers. Once you are satisfied with your message, click the "Launch SMS" button! 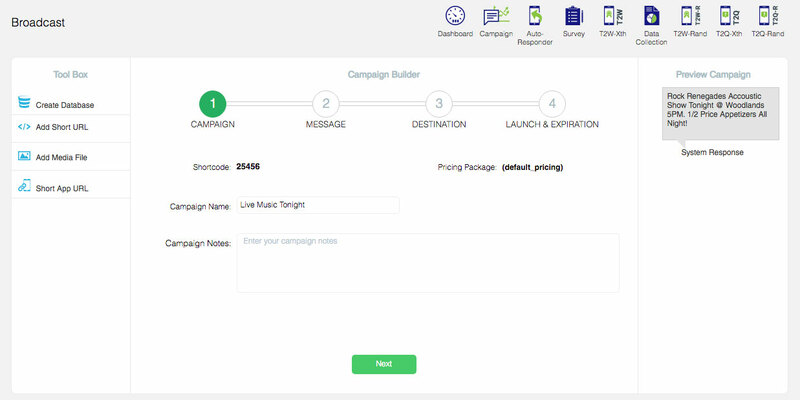 Similar to Quick Broadcast, our traditional "Broadcast" module allows you to setup a new message campaign but has additional options not available with a quick broadcast. These additional features include adding short urls, media files, app urls, sending to multiple contact lists, MMS, database filtering, recurring messages and more. Compose the message you'd like to send in the "Message" box. This will be the message your customers will receive. Note: The counter to the left of the box will show you how many characters you've used. If you exceed 160 characters in an SMS, our system will split your message into multiple SMS messages. The preview on the right side of the window will show you how your message will look for your customers. Choose the database(s) to which you'd like to send your message by clicking the "+" next to the list name to move it to the right/selected side. Broadcast messages also will default to "Launch Now" and be sent out immediately, so make sure to select "Date" if you want to schedule your message to go out at a later date or time. If you would like to have your message be resent at a recurring interval, choose the "Recurrence" option and select your preferences. Once you have completed the above steps, click the "Launch SMS Campaign" button!